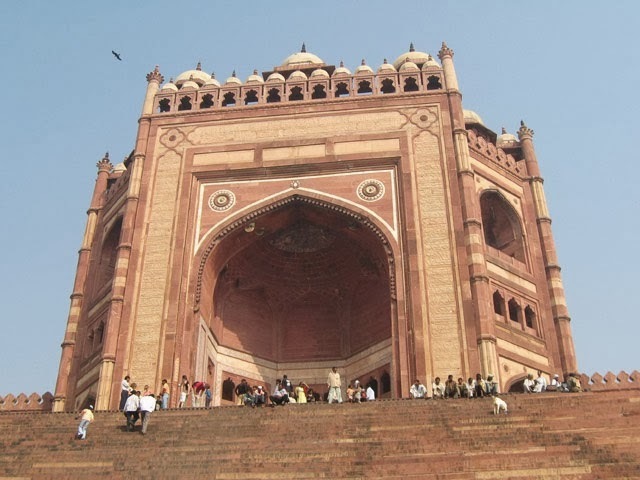 Fatehpur Sikri now-deserted city of Fatehpur Sikri was the capital of the Mughal Empire for nearly 10 years, was built by Emperor Akbar. Today, a World Heritage site, it houses within it some of the most magnificent buildings. Of particular interest would be the Diwan-i-Am, where the ruler met the public and the Diwan-i-Khas or the Hall of Private Audience, marked by its central pillar and vaulted brackets. The Panch Mahal is a five-storeyed palatial structure and the tallest in the compound. The Jama Masjid is one of the largest mosques in India and has several aisles around a central courtyard. It houses within it the tomb of the Sufi saint, Sheikh Salim Chisti. The Masjid is decorated with inscriptions, geometric patterns and colored tiles. A distinguishing feature - watch the rows of chhatris over the main building. The Buland Darwaza, rising to about 45 ft, was added to commemorate Akbar's victory over Gujarat and is inscribed with splendid calligraphy. Jodha Bai's Palace is perhaps the grandest of all palaces here with its large courtyard surrounded by pavilions - note its beautiful green glazed roof tiles.